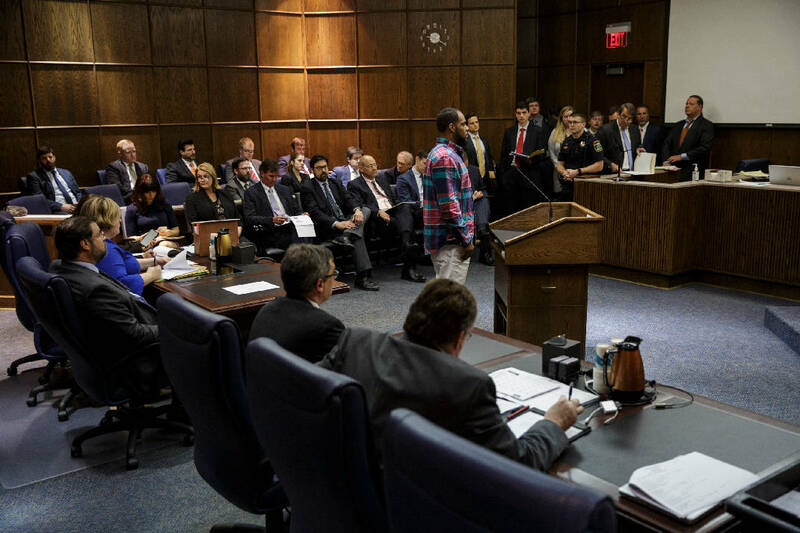 Staff photo by Doug Strickland / Attorneys fill the room as a defendant is arraigned in Judge Tom Greenholtz's courtroom in the Chattanooga-Hamilton County Courts Building on Friday, April 27, 2018, in Chattanooga, Tenn. 45 of the alleged Athens Park Blood gang members indicted last month on RICO charges were arraigned Friday. A Chattanooga man recently spent five days behind bars on a bond he already paid, and others nearly met the same fate because of a paperwork gaffe in the local jail system. Fifty-five men and women have been in the process of getting rebooked at the Hamilton County Jail since Aug. 14, when prosecutors secured a new, more detailed criminal indictment against them for their alleged pattern of illegal activity in the Athens Park Bloods street gang. Whenever there's a new indictment, it's not uncommon for officials to issue a warrant for someone's arrest, make them return to jail and have their mugshot retaken. Sometimes, they have to make bail again, too. But in this case, which started in late March, Judge Tom Greenholtz wanted to avoid that. Except for eight cases in which he raised the bond because of the seriousness of the new allegations, Greenholtz wrote in an Aug. 14 order that he wanted to keep everyone's "currently established bail" the same and transfer it from the old indictment to the new one. But somewhere between the courthouse, the jail and Silverdale Detention Center, that message didn't translate. And with at least eight defendants reporting this Friday or weekend, defense attorneys hope the confusion clears up. Henry Beard, a defendant in the racketeering case, posted $17,500 in bail on June 8, according to Criminal Court records. He returned to jail Aug. 12 when he was arrested on new robbery, theft and domestic assault charges. A judge ultimately released him on a personal recognizance bond. But when he was rebooked on Aug. 31 for the new racketeering indictment, his lawyer, John Wysong, said Silverdale wouldn't acknowledge that Beard had previously made bail and therefore didn't have to do it again under Greenholtz's order. Beard spent Labor Day weekend in the facility and wasn't released until Wysong was able to raise the issue with Greenholtz after the holiday. The judge's secretary then sent over a spreadsheet with Beard's bond information, Wysong said. "He didn't have to pay any more money, and he also spent five days in custody he didn't have to spend," Wysong said. "I assume there's something he missed that weekend that was more enjoyable than sitting in Silverdale." Jason Clark, the county's superintendent liason to Silverdale, which is operated by private prison operator CoreCivic, said his staff saw the outstanding arrest warrant for Beard in the racketeering case around the same time he was given a personal recognizance bond for the robbery case. But the staff only had an order from Greenholtz with dockets listed on them, not full names, Clark said, and didn't feel comfortable releasing someone without more information. "We did not have a proper court order that would have correctly released Henry Beard until September 5," Clark wrote in an email. He later added in a phone call: "It's unfortunate he had to sit here a few additional days, but a few people got their wires crossed. Really no excuse for it, but we know how it happened." Greenholtz declined to comment Wednesday. But his Aug. 14 and Sept. 4 orders are posted on his website, and both were entered into a filing system that's accessible to county and jail officials. Robin Flores, a Chattanooga attorney who often represents people in lawsuits against the county jail and Silverdale, said it's not uncommon for the facility to release people late, though it could be a legal offense. In 2016, Flores represented a woman who said she unjustly served an additional two weeks at Silverdale after someone incorrectly reported that she failed to show up for her public work days and a warrant was issued for her arrest. But the cases are difficult to litigate because, short of a medical emergency, it's hard to quantify someone's damages, he said. At least one other racketeering defendant nearly encountered Beard's predicament. Desmond Beamon, who posted $5,000 in bail in March, when the first indictment came down, went to be rebooked on Saturday. But similar to Silverdale, Capt. Gene Coppinger said county jail staff regarded the arrest warrant as a new charge. "There was no reason to question anything and on both occasions Mr. Beamon was processed and released within reasonable expectation," Coppinger wrote in an email. Beamon's attorney, Brian Caldwell, told Greenholtz during a hearing Monday that his client had to pay new bond as a result. Attorney Lloyd Levitt said in a separate interview that his racketeering client also had to make bond twice. "My belief is [the bond company] will not actually charge you," Greenholtz said to Beamon from the bench. "We'll make sure of that because I think it's outrageous you had to make a new bond on that."